See more photos from our adventures in anchoring. "Like" and "Follow" SlowBoat on FB to keep those pictures coming in your feed! We anchored out off Valcour Island to enjoy the incredible mountain scenery of Lake Champlain. Next morning, as we were wrapping up boat chores, a couple pulled up in a little dinghy. Peter and Claudia live on the shore. They saw us putter by and were curious about our oddball boat, found our blog online, and came out and say hi. That's one of our mottos. (Ssecond only to "We have a plan and we're not sticking to it.") Usually when we're in a new place, we head for the nearest pub and spread our charts on the bar--putting out bait that attracts local sailors who know the waters. It's big, it has a red roof, it's high on a cliff so sailors can see the light. How did we miss it? But sometimes local knowledge comes to us! Having explored the lake intensely in their own boat, Peter and Claudia had loads of tips. One was, be sure to see the lighthouse in the next bay. Lighthouse? What lighthouse? We cruised all around the island before dropping anchor and completely missed it! One thing we've found heartwarming both on this trip and on our Great Loop trip is how boaters look out for one another. People you have only just met will offer you charts, a helping hand, or the keys to their car. Our visitors are docents for the Bluff Point Lighthouse. They promptly volunteered to take us over in their dinghy and show us around, even though it wasn't an official "lighthouse open for tours" day. Wow! We love lighthouses. This one is particularly charming to look at. It was built in 1870 overlooking the site where Benedict Arnold's ships did battle with the British in 1776. Thanks, Peter and Claudia, for a memorable outing! While I'm on the topic of The Brotherhood of the Boaters! 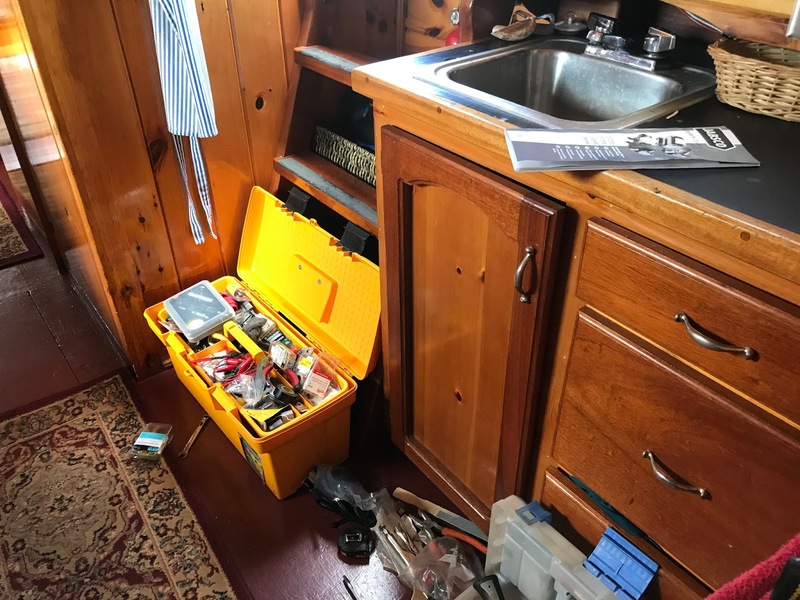 The night before, as we were entering a different anchorage in Pellot's Bay, we passed a striking boat, a steel-hulled trawler that looked like a working fishing boat. A good-looking boat right down to the bright-red dinghy! We love big steel boats. So we admired its graceful lines, a little wistfully. Our boat is such a conversation starter, we're constantly giving tours. But that seems to mean we rarely get to see OTHER people's boats! Speaking of boater customs, around cocktail hour in an anchorage, folks tend to get in their dinghies and go visiting. This evening, the folks who came to say hi were Flavio and Laura--owners of the trawler! They joined us on board and we had a wide-ranging fun conversation. Flavio and Laura also know the lake inside out recommended some good anchorages. Next thing we knew, we'd been invited back the next morning for espresso and croissants on the trawler. Laura and Flavio, thanks so much for the treat, and for the tour of your awesome boat! Dragonfly (see her roof at right?) was excited to meet another steel-hulled boat. Reminder: For bonus pix, remember to like and follow the SlowBoat Facebook page, which has some updates on our final days in Canada: chasing a mountain and traveling back in time at a French-Canadian fort. 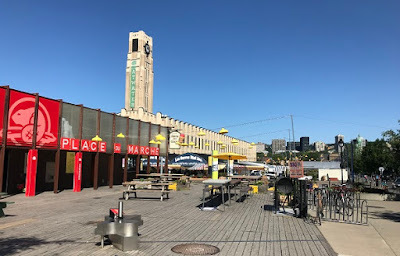 On July 19, we reluctantly said goodbye to the quaint French-Canadian towns along the Richelieu and crossed the imaginary line back into the United States. Just like that, we had entered a new stage of our trip: Lake Champlain. Back in June, our entrance into Canada had been casual: I made a phone call from the dock, and voila! we had cleared customs. Our cruising guides said the same would be true as we returned to the States. So we set a course for the first marina past the border. that bridge were lower . . .
That's when we heard a blaring horn and then a voice, on a loudspeaker. 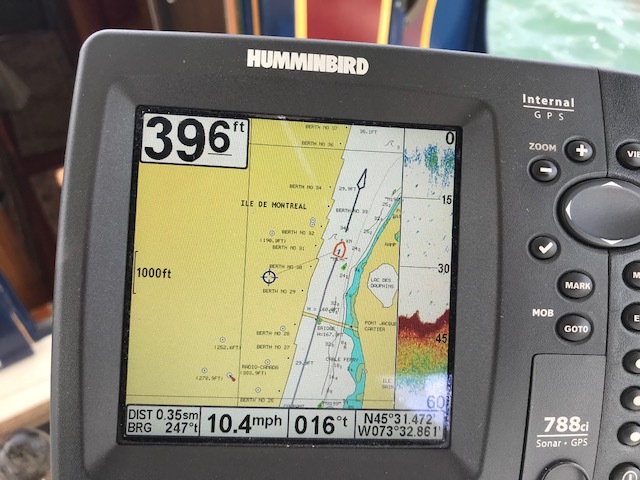 A pilot boat came speeding toward us, blazoned with the word "Sheriff" and with--yes--blue lights flashing. Those cruising guides were out of date. We did indeed need to stop at the tiny U.S. Customs trailer on the hill. We admitted to bringing in a couple cans of beer. The customs agent didn't even ASK about pepper spray! We could be an excellent stealth Homeland Security vessel. Bad guys wouldn't suspect a thing! Last week we docked at St. Anne de Bellevue. The lock wall is a lively place, with families out for a fresh-air promenade in the parklike setting. Cap was on the stern, fielding the usual questions: "Did you bring your boat here from England?" "Does it really run on solar power?" "How far can you go in a day?" One passerby was a young man carrying a skateboard in one hand and a beer in the other. Tristan volunteered that he, too, was a fan of heavy steel boats--because he was a tugboat captain himself. Really? Really! Come aboard, then! We talked for more than an hour, about the minutae of tugboats and so much else. It was heartwarming to learn his story. Tristan grew up boating on the river. He went to college for psychology . . . until a helpful professor made him aware of the jobs available on the river--good pay, and the schedule is two weeks on and two weeks off. He switched his course of studies and never looked back. This jet boat outside Montreal did a tight circle around us. All too often a big, powerful boat passes by, going fast, throwing up a big wake that rattles the china in the galley and sets our wooden doors to slamming. "Is it our American flag?" I asked Cap. "No, probably just cluelessness about the boater 'Rules of the Road,' he said. Even so, when we left Montreal on the Saint Lawrence River, I was nervous about our first stop, an anchorage in a shallow bay. "Should we take in the flag?" We left it out, and shortly before dusk, I could hear the whine of a motor: a fishing boat, coming really close, kind of fast. I peeked out the window, bracing for a contentious conversation. It was a dad with his teenage daughter and her friend. They had come to tell us, in hesitant English, how much they liked our boat. A lively conversation followed, about boats, fishing, applying for college. Our visitors left as the light faded, leaving behind a little warm glow of friendliness. The iconic mountain that is Montreal as seen from the Ottawa River! We left the St. Anne de Bellevue Lock on a bright morning. A few hours' travel on bouncy waves brought our first sight of Montreal. Closer to shore, we scanned for the buoys marking the entrance Lachine Canal. 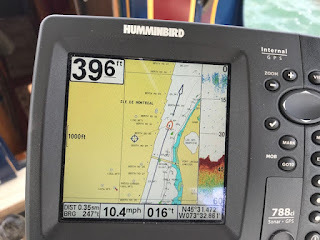 After a long, slow, puttering trip down a narrow channel that took us just feet from the boats docked in an enormous marina, we, finally arrived around noon outside Lock 5. Like the other canals we've visited, the Lachine was built for commerce. It cuts through a neighborhood where warehouses and factories crowd the banks. In planning this trip we were relieve to learn this canal was in fact open, not closed as some guides suggested. Were it not for the Lachine, we would have had to continue on the river, around the island of Montreal . . . and when we reached the juncture with the St. Lawrence, the current would have been too strong for us to turn back and enter the city. There was just one tiny problem. The Lachine has several bridges that are a mere 8 feet above the water. 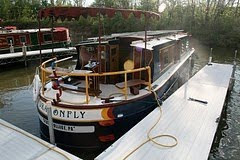 Dragonfly is 9 feet from the waterline to the top of her canopy. Well! We've played this game before! 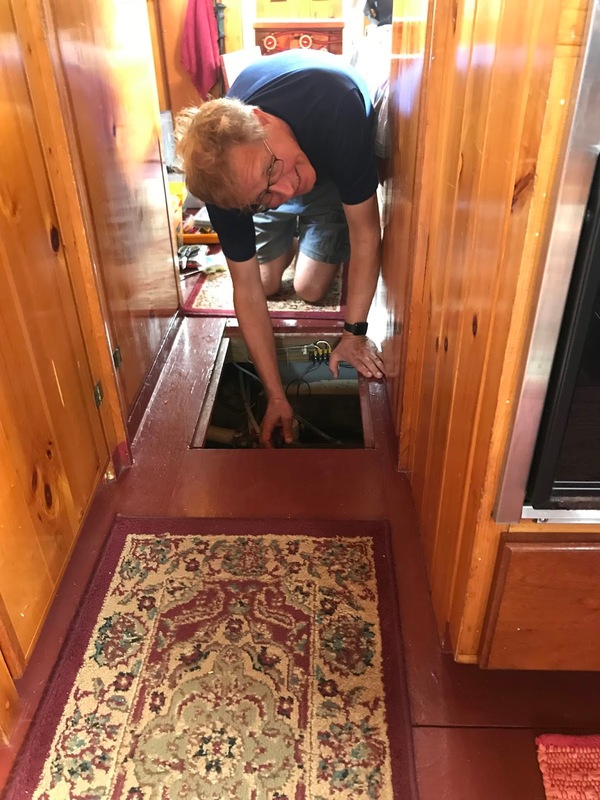 It so happens that if you unscrew the metal poles supporting our stern canopy and lower the canopy to the deck, we are a mere SEVEN feet tall. So that's what we did! (More photos on Facebook.) 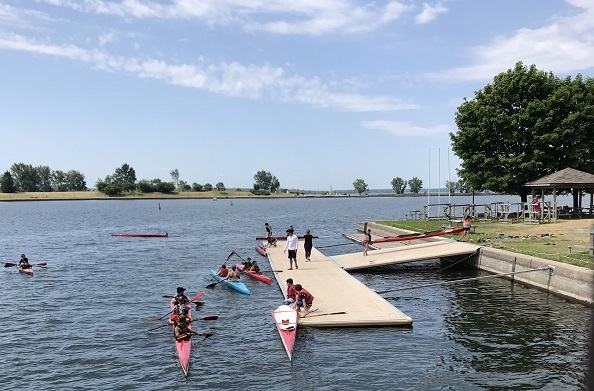 Lachine Canal, here we come! several times to get weed off our propeller! The last installment of the SlowBoat "What IS It?" quiz invited you to identify a strange machine that seemed to be steamrolling the river. Hats off to Jonathan Shanks who correctly identified it as a weed harvesting machine. He'll receive the SlowBoat prize, a genuine post card via old-fashioned snail mail. (In case you want more info: The Rideau Canal is infested with an invasive water weed. It gets wrapped around your prop shaft and slows you down. The weed eater is one way that the government keeps the route a little more clear for boaters. Why are those little round floats arranged in such nice, straight lines? This one also comes from the Rideau Canal. Outside the Manotick Lock, we noticed a whole field of little round floats. They seemed to be arranged in nice, neat straight lines. We've been flummoxed by floats before, notably the fishing noodles we spotted on the Ten-Tom Waterway during our Great Loop Cruise. Oyster farm? 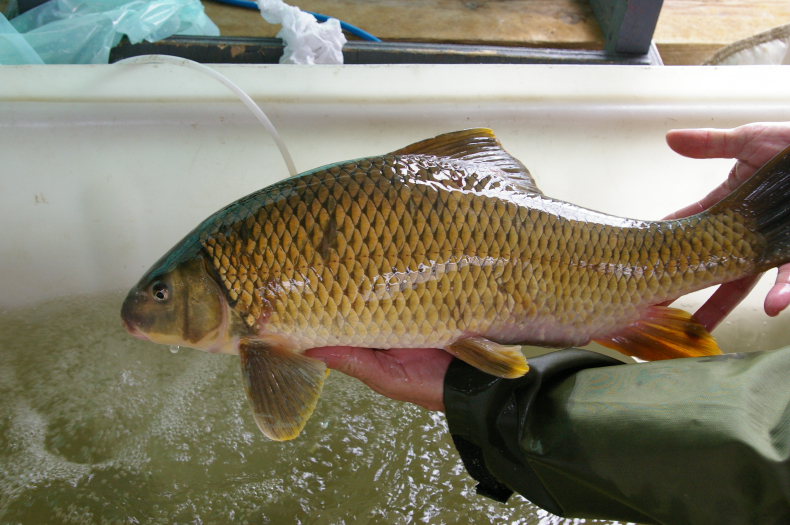 No, this is freshwater. Freshwater pearl farm? Good guess, but no. This field of floats at Manotick, however, has nothing to do with fishing. So, what IS it? Write your answer on a Pestzilla TM Robust UV Electronic Bug Zapper and send it to . . . oh wait! We don't get mail delivery on the boat! Use the comment function below, put a note on the SlowBoat FaceBook page, or email Cynthia. You could be our next lucky winner! Plain toast? Never! We serve avocado toast on THIS boat! Or say you DO have a toaster but you are anchored out, not plugged in to shore power. That toaster will drain your house batteries faster than you can say "What about my blow dryer?" Never fear. You can still make delicious buttery toast in two minutes flat. Melt some butter in your trusty skillet. Adjust your heat to medium-low. Give it a minute. Use a spatula to check. When the bread looks toasty, flip it. You already buttered the side that is now down against the pan. No need to add more butter! Repeat step 4. When your toast is ready, breakfast is served. Always remember, a well-fed Captain is a happy Captain! Check Facebook for a photo album showing our transit of Carillon Lock! Rideau Canal locktenders don't need to hit the gym to lift weights after work! 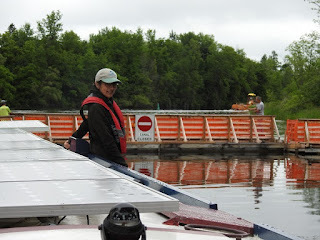 We loved the Rideau Canal and its charming limestone locks, their doors operated by locktenders using antique machinery. We were sad to say goodbye. Happily, we still have many more historic Canadian canals to transit! 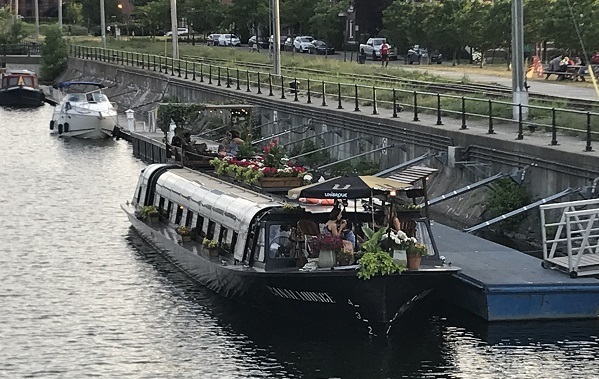 On Saturday July 7 we left our peaceful anchorage on the Ottawa River, headed east toward the Carillon and St. Anne-de-Bellevue locks, and ultimately, Montreal. Before the Locks, a Log Castle! We stopped at the town of Montebello to view its most famous attraction, The World's Largest Log Castle. (For real! The world's largest structure built entirely of logs. Red cedar, specifically.) This picture doesn't do it justice; you're seeing one tiny corner of the whole. Chateau Montebello was built in 1930, using 3,500 workers who finished the job in four months. For its first 40 years, it operated as a private club. (Jews were not allowed, among others). Today it's a luxury resort with stables, mini-golf, and off-road SUVing. We stopped for the night in the town of Hawkebury. Our dorm-sized boat fridge took this opportunity to die, leaking loads of water from the frosted freezer compartment across the kitchen floor. Cap got 'er fixed up just about as fast as he got that new water pump installed. Ice cubes didn't even thaw. Check out the counterweight that raises and lowers the gate! To make the trip through the lock with us, see the album on Facebook. On Sunday, July 8, we set a course down the Ottawa River for the Carillon Lock. Like the Rideau, this brief canal and its single lock were constructed after the War of 1812 as part of a proactive military effort to make sure they had transportation channels that would be safe from American attack. Where the Rideau is almost unchanged since it was built nearly 200 years ago, the Carillon was majorly reconstructed when a hydro dam was completed in 1964. So this lock is modern as modern can be, lifting (or lowering) boats about 64 feet. The striking 200-ton"Guillotine Gate" at the downstream end of the lock goes up and down like, well, the blade of a guillotine--a contrast to traditional lock gates that swing like doors. 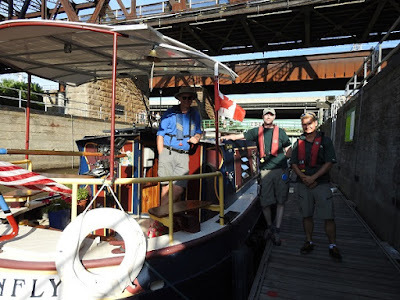 On the Rideau, a locktender had told us that he and his colleagues looked favorably on boats that bestowed pastries. So Cap was ready with a platter of freshly baked peanut butter cookies for the two young ladies who handled our lines. From Carillon we had a windy and bouncy ride up the river. Finally we reached the safe harbor of St. Anne-de Bellevue, where the lock, in great contrast to Carillon, lifts just a few feet. The St. Anne locktenders were just as charming as the Carillon locktenders, and just as pleasingly surprised by their cookies. That's what I always say about Cap. Witness Friday morning July 6. Uh oh. Serious toolboxes. This means trouble . . .
We’re ready to leave the Lac Leamy Casino for the next stage of our trip, 100 miles on the Ottawa River. Our water pump chooses this moment to die. This is bad. We plan to anchor out the next few days. Without a pump, our sinks, shower, and toilet won't work. What will we do for water? 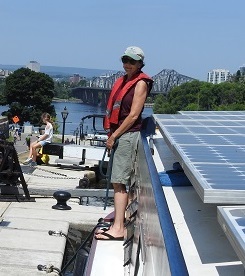 Flash back to Kingston, at the head of the Rideau Canal. We visited Vandervoort General Store, a funny old-fashioned place that, in addition to curtains and t-shirts, sells marine supplies. “The water pump’s been acting up,” Cap said. “They have the pump we need. Maybe we should get it. "But it’s expensive,” he sighed, putting the box back on the shelf. “I think we should get it,” said the crew, fishing out a Visa card. So when our pump died this week, we had a backup pump on the boat. No need to search frantically for a West Marine and figure out how to get there without a car. Cap installed the new pump in about an hour flat. Because even though he’s not a certified marine mechanic, he plays one in this movie. can be useful aids to navigation! The previous days had been scorching. This day was cool, overcast and windy. The Ottawa River is wide, so the wind kicks up whitecaps and little rollers. We hunkered in sweatshirts, cruising past cottages with docks, big farms with tall silos, and little towns marked by their churches. Tinplate is a common roofing material for French-Canadian churches, and the silver steeples gleamed even on this dull day. At one point, Cap called crew on deck. ‘Grab your binoculars and take a look. I can’t figure this out! "These two boats seem to be weaving back and forth, passing each other.” Why would they be doing that? As we drew closer the optical illusion resolved. Not two but six big ferries. Not passing one another in line, up and down the river, but traversing across. This is not a drill. Where should you pilot your SlowBoat? Now we had an interesting challenge: How to thread the needle. The ferries had the right of way. They were moving quickly--much faster than we could run. At any given moment at least two were mid channel, sometimes more than two. There didn't seem to be a pattern to when they departed shore. Could we stay out of their way? We didn't move QUITE as fast as this jet skis. But pretty good for a SlowBoat! This was where Cap’s back-up battery bank proved its worth. Calling on both batteries banks at once, he was able to punch up a little extra power and goose us through the gauntlet. We anchored out that night in a narrow channel behind Isle Dube. No signs of human habitation. No road noise. Water pump performing perfectly. At dusk a chorus of birdsong broke out, including the haunting spiral of a veery, a bird of deep woods. We lit the Shabbat candles and said our usual prayers--substituting “boat” for “home” in the blessings.